− 5 = two Required Please enter the correct value. The SunEdison stock price is tanking again today (Wednesday) following debt negotiation talks. This is just the latest string of bad news for the company, which has had an extremely rough 2016. Shares of SunEdison Inc. (NYSE: SUNE) plunged more than 15% to $1.24 in morning trading after it was reported Tuesday that the company is in talks with creditors over $725 million in second-lien loans. The news comes just two weeks after SunEdison scrapped its $2.2 billion cash and stock acquisition for Vivant Solar Inc. (Nasdaq: VSLR). Instead of deal-making, SunEdison is now reportedly engaged in debtor-in-possession negotiations. And that has the SunEdison stock price crashing. Since Monday, SUNE stock is down 37%. Talks this week focused on providing the company with about $300 million in new liquidity, according to Reuters. The talks follow unsuccessful attempts by second-lien lenders to reach an out-of-court solution for the cash-strapped company's debt issues. SunEdison declined to comment on the reports. But a cash crunch at SunEdison has been widely acknowledged for months. 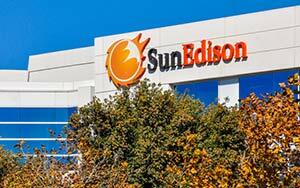 SunEdison had outstanding debt of $11.67 billion as of Sept. 30. At the same time, it had cash and cash equivalents of just $2.39 billion. SunEdison and its yieldco (a company formed to own assets that produce cash flow) TerraForm Power Inc. (Nasdaq: TERP) have more than twice delayed filing their 10-K annual reports because of the SunEdison liquidity investigation. Current and former executives alleged in late 2015 that SunEdison misrepresented its liquidity stance. Last week, SunEdison said no material mistakes have been found in the audit thus far. Still, the audit is holding up both 10-K filings. Delaying its 10-K has put TerraForm out of Nasdaq compliance. It formally has until May 16 to submit the form or file a plan to regain compliance. Still, TerraForm could get until Sept. 12 to become compliant or face delisting. Plus, at least four law firms are investigating whether TerraForm Power violated securities laws related to the fraud and insider sections of the Securities Exchange Act of 1934. All of these issues have caused SunEdison stock to drop 74.26% year to date. TerraForm is down roughly 31%. Like other solar companies, the SunEdison stock price also suffered because of crashing oil prices. When oil prices are lower, demand for solar power decreases. That can cause major drops in solar stocks. But SUNE stock had also been under pressure as the company tried to grow quickly via acquisitions and burned through cash. Despite SunEdison's woes, the solar industry continues to grow at a huge rate. And one country just pledged a $100 billion investment in the industry over the next six years. That's having a major impact on the overall solar industry. Solar stocks received a major catalyst in December when Congress passed a bill extending solar credits for another five years. The credit extension will add an extra 20 gigawatts of solar power to the U.S. grid. That amount of power is more than every other panel previously installed in the United States prior to 2015 can provide, according to Bloomberg. The United States is already one of the world's biggest clean-energy investors, but the extension is a major boost to the industry and solar stocks. Roughly $73 billion in new solar investments is expected by 2020. That will provide eight million more American households with access to clean, renewable, affordable energy. Money Morning Global Energy Strategist Dr. Kent Moors says 2016 will be a very important year for solar stocks and for the industry as a whole. "Solar is here to stay," Moors said. "There's now a confluence of technology and economy that assures these new energy sources will continue to be adopted and improved upon – at ever-increasing rates." You see, countries around the world are ramping up solar production. China is projected to spend $83 billion on solar energy projects in 2016 thanks to the government's new panel installation quota. The Indian government is investing $100 billion to install 100 gigawatts of solar capacity through 2022 – up from the nation's current capacity of 4 gigawatts. Increased solar spending and extended solar tax credits will bring new life to the industry in 2016 and beyond. I would like to hear your thoughts on todays premarket sell off along with the news that Terraglobal filed their 8K. Are you still hold long?